Continuing its self-improvement goodwill streak, McDonald’s announces today that it will start using paper straws instead of plastic ones at its U.K. branches. Although the plastic straws are recyclable, Fortune points out today that most people are still just throwing them away. Fortune also says that McDonald’s U.K. CEO Paul Pomroy told Sky News that “customers have told us that they don’t want to be given a straw and that they want to have to ask for one, so we’re acting on that.” Servers will have both paper and plastic straws available on request. 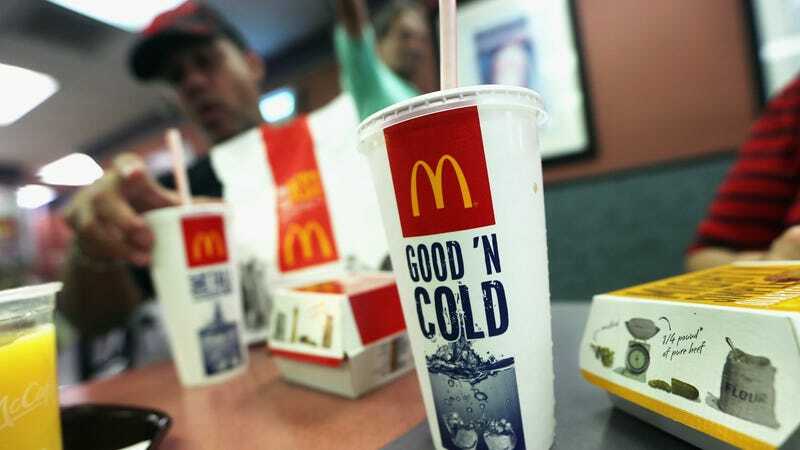 McDonald’s move follows similar efforts across the globe, like proposed legislation in California that would make it illegal for servers and bartenders to serve a drink with a straw in it without being explicitly asked. Straws make up a considerable portion of marine environment pollution. I try to be as environmental as the next person, but it is nearly impossible for me to drink a fountain drink strawless. Am willing to give the paper straws a try, of course, but how do they not collapse once they get wet? It may be time for me to consider investing in a metal straw to carry around in case of frequent straw emergencies—but I fear the chances of me doing that and not having people think that I am also a cocaine addict are rather low.